In our industry up-time is essential. You’ve made the investment in purchasing a piece of equipment for your jobsite and we want to make sure that piece of equipment stays up and running for you. The most important piece of maintenance for the operator should be checking the safety features daily. Heath says, “I always begin any maintenance conversation with safeties and making sure that all the safety features on a piece of equipment are intact and operational.” The Emergency stop button and the tethered stop switch should both be checked every day to ensure they are functioning properly. Heath advises owners to make sure fluids and filters are changed according to the recommended time schedule, and to use quality filters and fluids. The maintenance schedule and factory recommended fluids can be found in the operating manual. From the electrical side of things, it is vital to check the connections. “Continuous monitoring of the electrical connections on the machine can help alleviate nuisance issues that can occur when wires are not properly connected.” During the operation of an auger boring machine, the inherent vibrations can cause a nut or screw in the electrical circuit to come loose, so checking these connections on a regular basis can help keep the machine running efficiently and smoothly. Checking the alignments of certain components of the auger boring machine can also help to reduce wear. “There is a gear rack on the top of the tracks and a pinion gear that engages the gear rack. There must be a specific air gap between the bottom of the tooth and the bottom of the root of the gear rack.” This information and proper spacing size are available in the manual. “If that spacing is not right and that pinion gear is pressed up against the side of it, it can wear on the pinion shaft.” There are also wear points when the machine is in the track. The spacing between the bar that maintains the machine in the track and the pocket of that track the machine rides in should be checked as well. Properly maintaining these alignments will help reduce wear in the machine’s components. It is also important to maintain the proper fit clearances on the tooling when the auger is coupled with the machine. Heath said, “The auger has the male pin and the machine has the female socket. Over time, that fit can get sloppy from wear. This runs the risk of damaging these components.” Properly maintaining these alignments can help reduce wear on the auger boring machine. Heath also advised that operators properly protect the machine on the jobsite. 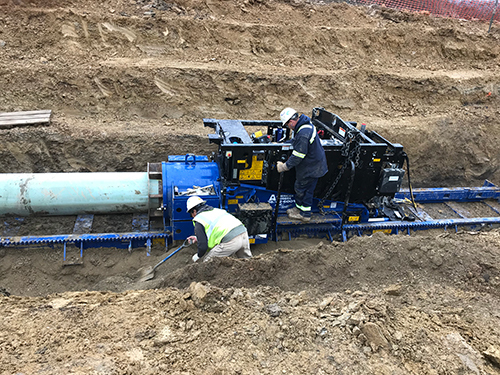 “If the machine is in any type of water, saturated soil, or the possibility of the pit flooding, it is necessary to maintain some type of pit drainage system.” Whether it’s a drainage tile or a pump in the pit, it is critical to ensure that the system is properly maintained. The engines in the auger boring machine can flood, leading to serious damage which can be costly and result in serious downtime of the machine. If you have any questions about the maintenance of your American Augers or Trencor equipment please contact us.